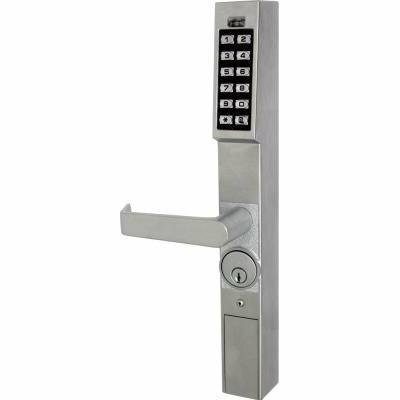 Aluminum door retrofit outside trim for Adams Rite 4710, 4070, 4730, 4900 Series latch locks Add keyless convenience to mechanical latch locks from Trilogy's all-metal, vandal-resistant 12-button keypad and/or automatic timed-scheduled locking/unlocking and audit trail with 1300 Series DL1300 supports 2000 users, PC programming/reporting and features 40,000 event audit trail by user and 500 event schedule/real time clock (e.g. lock/unlock by time) Weatherproof -31? ?to +151? ?F (-35?? to +66? ?C) Long-life, battery- operated for 100,000 and 80,000 cycles respectively, typ.on 2 lithium 3V batteries, supplied; low battery alert Compact styling 14-3/8"H x 1-5/8"D x 1-3/4"W Backsets 31/32",1-1/8" and 1-1/2" ; Stile thickness 1-3/4" Non-handed; fully field-reversible Available finishes: Satin Chrome US26D and Duronodic US10B.